Recently the the VMML at the University of Zürich performed a benchmark comparing Chromium and Equalizer on a display wall. The result surprised me, as I would have expected less difference between the two solutions in this setup, since only static display lists are used. Unfortunately neither InfiniBand nor the broadcast SPU were available for this test, which should improve the Chromium performance. The performance graph is on the left. You can download the White Paper from the Equalizer website. Often I am getting into discussions between the differences and the overlap between Chromium and Equalizer. Just recently I had an email conversation with one of the Chromium contributers about the comparison on the Equalizer website. The point of this post is to get your feedback and input to make this page easier to understand and more balanced. Admittedly, the page simplified things quite a bit. I tried to keep things simple in order to make the main differences clear. On the other hand, this was unfair for Chromium, since it failed to mention it’s parallel programming aspect. I have updated the page already, but now it is no longer simple. My opinion is that most of the time Chromium is used and perceived as a tool to run unmodified application in a one-to-may display wall configuration. 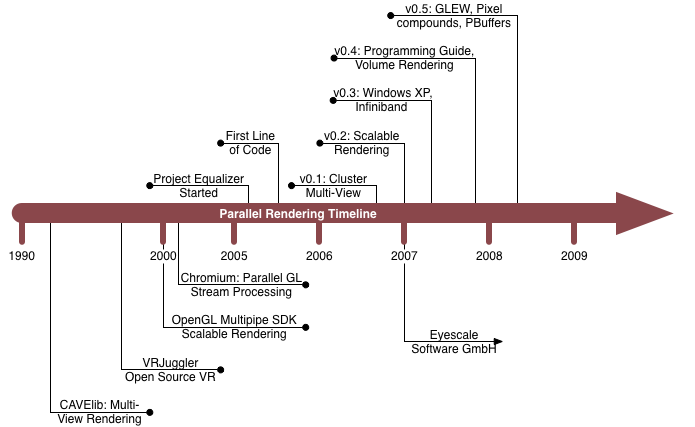 The parallel extensions (composition and OpenGL synchronization) are helpful when developing parallel applications, but don’t go far enough. Personally I think that Equalizer addresses more of the common problems for parallel OpenGL applications (configuration, synchronization, network distribution) and is the better tool for developing a parallel application. 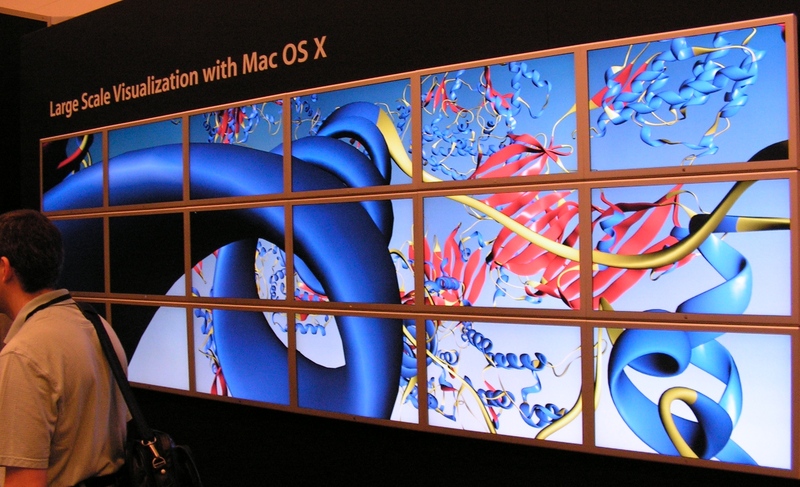 On the other hand, Chromium is an excellent tool to run unmodified OpenGL applications on large-scale display walls, as demonstrated at WWDC’07. So – what do you think and what would you change on the comparison page? Are there other arguments you see for Chromium or Equalizer? Please leave a comment and I’ll reply. Things are moving well now – VMD is working as well for the WWDC display wall demonstration. 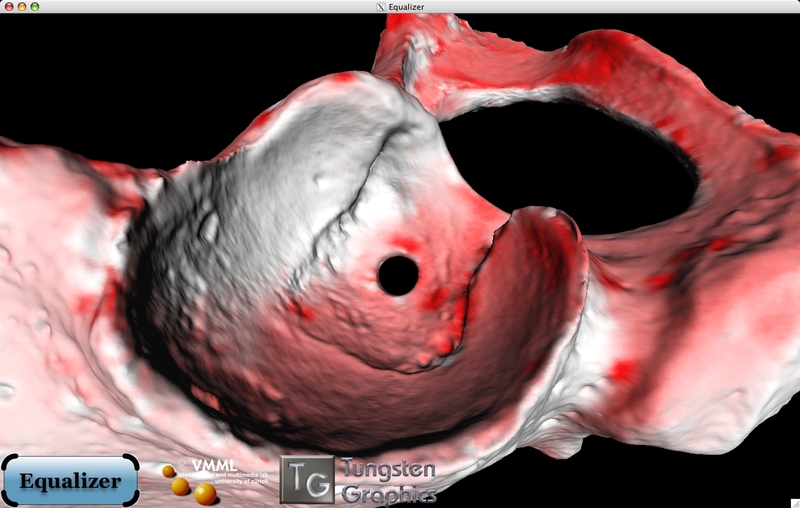 This covers a little bit the whole scientific visualization angle. 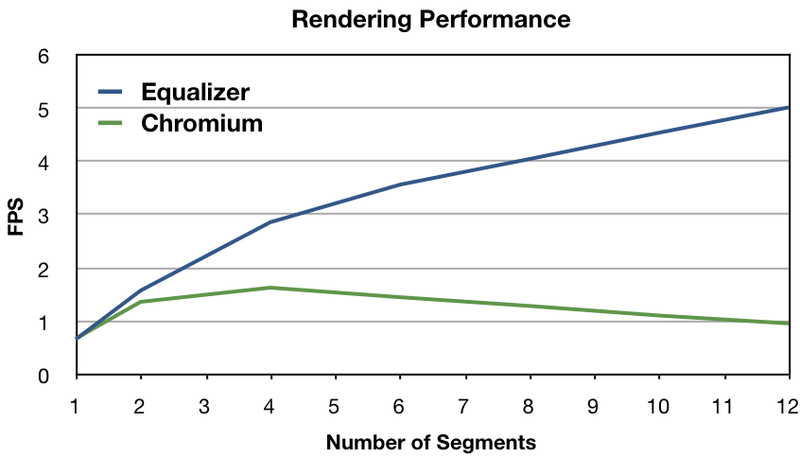 Performance is really good if you enable ‘cached rendering’ (display lists?) in VMD. 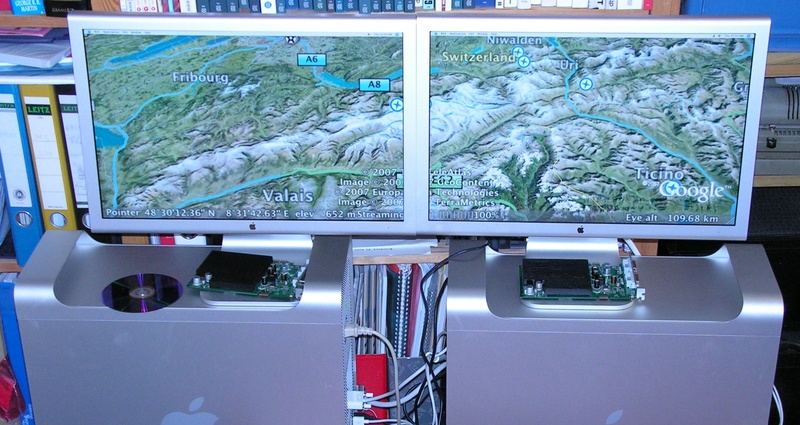 Finally a cool application for demonstrating Chromium on OS X: Google Earth! After some fixing of the CGL/AGL Chromium code, customizing the config file, removing all whitespace from the path and other minor issues I could get it running on my mini display wall I use for testing the WWDC07 setup. Chromium for sure is bandwidth-hungry. My MacBook Pro pumps out about 50MB/s (bytes, not bits) to the two MacPro’s – thankfully the broadcast SPU works. I can’t wait to see it on the big wall! Apple will be demoing a display wall made out of 5×3 30-inch cinema displays at WWDC07 – that’s 3.4×1.6m (136×63.9 inch) or in other words: a 150-inch display with a 60 MPixel resolution! And what is even better – I will be there with a colleague from TG to show Chromium and Equalizer, talk to the developers and get the Mac people excited about parallel rendering.